The Ford Fiesta is one of the most popular subcompact cars on the market because it offers so many great attributes in one vehicle. At Fremont Ford, we know that the Fiesta is an exceptional value, whether you choose the entry-level S, the impressive SE or the sporty ST and ST-Line. Whichever trim line is right for you, you can show off your personal style behind the wheel of a Fiesta. This Ford offers 10 different exterior colors so that you can choose the personalized finish that meets your needs. With eye-catching options like Lightning Blue and Bohai Mint, you'll make a statement driving down the street. The premium paint options also offer metallic clearcoat beauty. 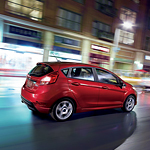 The options don't just end on the exterior of the Fiesta. Choose your personal style with seven different interior color options. You can relax in soft materials and enjoy ambient interior lighting.